PRO-INDEPENDENCE IN CATALONIA AND THE WEAKNESS OF THE LEFT: There is a growing clash between the PP (Popular Party) of the Rajoy government – which represents big capital and the multinationals – and the Catalan parties that defend neoliberal policies. This seems intractable in the short term, none of them wanting to concede for fear of looking weak. This situation has lasted so long due to the incapacity of the right to grant the smallest demand to the Catalan bourgeoisie. The latter is after more investments in Catalan infrastructures and services, as well as a greater reversion of the tax revenues collected in Catalonia by central power. It is with ‘nationalist’ demands therefore that an important layer of the radicalised petit bourgeoisie came face-to-face with the repression and the reactionary policies of the Rajoy government. Some far-left sectors like the CUP (Popular Unity Candidacy) took part in their mobilisations with a republican perspective, against the monarchy and for social transformation. They organised their movements with the idea of becoming a decisive force. When they helped the mobilisations in support of the political prisoners and the Catalan exiles, they were rejecting the repressive policies of the Spanish government. There is no great difference between the defenders of Catalan ‘sovereignty’ (for independence) and the ‘Constitutionalists. In the last regional elections (December 2017) the first won more than 2 million votes and the second 2.2 millions. Within the ‘Independentists’, Junts per Cat (Puigdemont’s Party) won 940,000 votes. This organisation favours a Republic but its programme is not very far from the Conservative PP . In the ‘Constitutionalists’, there are the PSC (Socialist Party of Catalonia) and Catalunya en Comu-Podemos. They oppose Rajoy’s policies but the Constitutional Reform they propose keeps Catalonia in structures connected with the central State. The right to self-determination has been a programmatic demand of the left since the end of the 19th century and beginning of the 20th. However, the defence that Lenin used to make of this right did not amount to independence. Where the relations between the different populations of one state are deep, there are possibilities to develop the economy, and raise the conditions of life and culture for everybody in that State. One cannot speak of the relations between Spain and Catalonia in terms of oppressing and oppressed nations. What one can see however is the drive of both bourgeoisies to hang onto their privileges. This is why, from the perspective of the left, it is fundamental to uphold the centralisation and independence of the working class movement in defence of its own rights and revendications (demands). We published on this blog “Regionalism in Spain, the class struggle and Socialism” by J Posadas. In that document, the author shows how anything that divides the proletariat weakens its ability to respond and strike at capitalism; and it fails at the same time to integrate in its centralisation the other layers of society that become radicalised. Right now, there are big social struggles in all the workers’ categories. There have been massive demonstrations of pensioners in all the towns; in their assemblies, people tore up official letters telling them their pension was going up by 0.25% in 2018. A true mockery when seen against plummeting purchasing power and the pitiful social supports. The government has had to back down and raise the minimum pension. This result shows that unified and nationally coordinated struggles are indispensable. 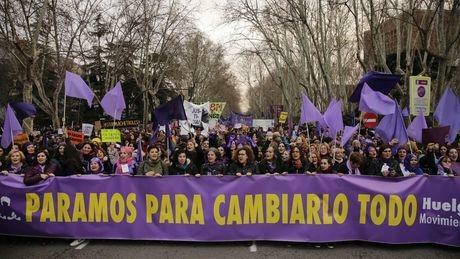 There were very important women mobilisations previous to International Women Strike’s day throughout Spain. The feminist organisations coordinated in complete independence, to prepare for their action on the 8th March 2018 . The social repercussion of their intervention was so great that the big Trade Unions were forced to call for, and organise in the biggest enterprises, two-hour work-stoppages per day and per work team. The feminist movement called for a strike of 24 hours (on March 8th). This had a great echo in the sectors involved with teaching, health and home-care where minimum services were put in place. In many cases, the men took over the domestic tasks and looked after the children – as the strikers’ movement asked them to. There were massive demonstrations in the large towns. Men, women and children took part with slogans in defence of the equality of rights between people and in support of the role of woman. Such things highlight the deep changes now taking place in society. A few months back, the PSOE (Partido Socialista Obrero) had opened a very hopeful perspective for Spain. Pedro Sanchez had won (in internal elections). You will find our article if you browse this blog. The Socialist militant base had intervened very strongly at the time, particularly the young. But the latter were eventually left with not enough political life and pathways to impose a change of course on the Party. This ended up with the new intake of Socialist leaders surrendering to the Socialist Party’s apparatus and its old leaders like Felipe Gonzalez. This event caused the Party to retreat from the positions originally presented by Pedro Sanchez – whose line had generally been for an alliance with Podemos to get rid of Rajoy. This retreat in the Socialist Party laid the ground for the PP to strike a deal with Ciudadanos, and return to government. The left alternative that Podemos had represented lost support and political authority. Its programmatic retreats and its lack of political functioning led to a fall in the participation of the groups at its base. The efforts it had made to stay on institutional roads had been much greater than its efforts towards the social movements and the workers’ movement. Ada Colau, Mayor of Barcelona. Ada Colau, Mayor of Barcelona. Xavier Demenech was leader of ‘En Comu- Podem’. In Catalonia, the positions of Podemos are contradictory. The independentist movement that they had allowed to grow internally ended up breaking off. There are now proposals of unification with Comunes – the movement of Ada Colau and Xavier Domenech. This could be important if it goes beyond accords between leaders and creates structures based on a programme of social transformations. It is necessary to move quickly out of this blocked situation in Catalonia. Urgent steps are wanted to solve the problems of public health, energy shortages, unemployment and the precariousness that blights the most deprived in the population. It is possible to do this. 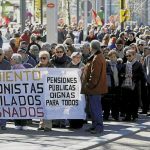 In Valencia, popular mobilisations have imposed the return ‘in house’ of the amenities at the Alzira Hospital that the PP had handed over to private enterprises. This example shows that the social conditions exist to reverse the privatisations that the European Union seeks to impose in all fields.